Fighting effectively against ARP poisoning with efficiency is not an easy task because the ARP protocol provides no possibilities to establish the authenticity of the source of incoming packets. Despite all, we propose here some ways to protect your machines against these evil spoofers. Static ARPing means that you manually configure IP to MAC mappings. - This will generate a lot of extra work for the administrator and is not applicable in an environment where the users have to move with their laptops. This will not prevent other types of ARP attacks such as port stealing. Arpwatch is a tool to monitor the ARP activity on a network and particularly when a change occurrs in the MAC address - IP address associations. For this reason, it can be helpful to detect ARP attacks such as ARP spoofing and can alert the administrator by mail in case of suspicious ARP activities (referred to as a flip-flop in Arpwatch). By default, Arpwatch sends its logs in the /var/log/syslog file, you can use the "tail /var/log/syslog" command to check the logs in real time. The configuration is stored in the /etc/arpwatch.conf file. 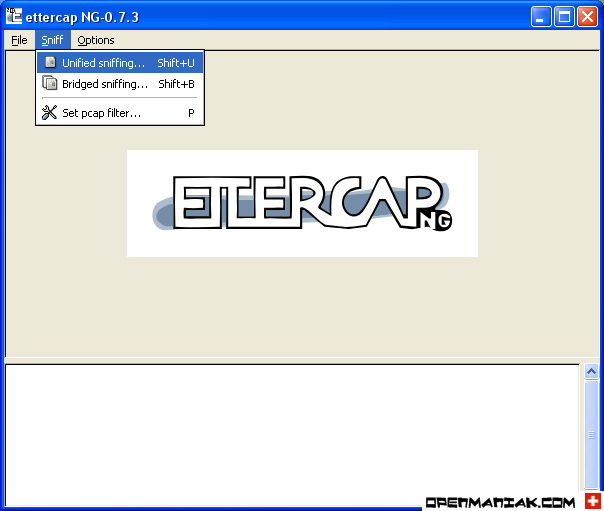 Install Ettercap in graphical mode. Launch Ettercap in graphical mode. Click on the arp_corp plugin to activate it. A Intrusion Detection System such as the Snort IDS can detect ARP abnormal activities and send a mail to inform the administrator. Port-security is a security functionality available on some high-end switches. It will allow only devices with certain MAC addresses to connect to the switch ports, and in case a machine is not authorized, the switch can take actions such as alerting the administrator with a SNMP trap or shutting down the faulty port immediately. Below an example with a Cisco switch where its first port (FastEthernet 0/1) is configured as port-security. The switch port will accept only one unique MAC address and this MAC address will be the first seen by the switch port (sticky keyword). If the switch port seee another MAC address on its first port it will immediately it shutdown. After the switch configuration, we plug a device with MAC address 1122.3344.5566 on the FastEthernet 0/1 port, which will accept no other MAC address. We unplug our current device (MAC: 1122.3344.5566) and plug another device (MAC: 1122.3344.9999). As seen below, the switch will shutdown its first port and put it in the err-disabled status. %PORT_SECURITY-2-PSECURE_VIOLATION: Security violation occurred, caused by MAC address 1122.3344.9999 on port FastEthernet0/1. The port-security activation will not prevent ARP spoofing but the possibility for the pirate to get connected to the network. There is no miracle solution to fight against ARP spoofing but the suggestions below provide significant help by either preventing the pirate from connecting to the network or by checking your network. - Network restriction with port security or even with the 802.1x protocol where a machine is authorized on the network only if it is accepted by an authentication server such as a RADIUS. Network surveillance with tools such as IDS.